Fireworks lit the sky as membership became effective at midnight (22:00 GMT), with President Ivo Josipovic describing the event as historic. It comes almost two decades after Croatia’s brutal war of independence. But correspondents say enthusiasm for the EU in the country has been dampened by the Eurozone crisis, and Croatia’s own economic problems. Celebrations took place in the central square of Zagreb, with fireworks and music including Beethoven’s Ode to Joy, the European anthem. “Welcome to the European Union!” European Commission President Jose Manuel Barroso said in Croatian to the cheering crowd. President Josipovic said it was “a great and joyful day for our homeland”. “This the day when we open a new chapter in the thick book of our history,” he added. Croatian officials then unveiled EU signs and removed customs posts at the borders with Slovenia, the first former Yugoslav republic to have joined the bloc, and with Hungary. Croatia is the first new EU member since Bulgaria and Romania joined in 2007. It is 10 years since it applied. Croatia’s split from Yugoslavia triggered a 1991-1995 war to secure its independence. But with one in five unemployed and Croatia’s national debt officially classed as junk, some Croatians feel joining an economic bloc with its own serious troubles will do little to improve their prospects. “Just look what’s happening in Greece and Spain! Is this where we’re headed?” asked pensioner Pavao Brkanovic in a market in the capital. “You need illusions to be joyful, but the illusions have long gone,” he told Reuters news agency. 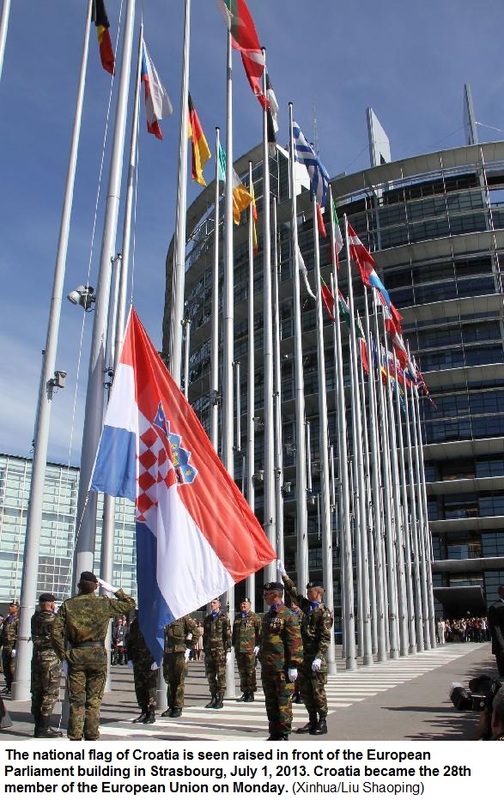 Concerns about Croatian corruption and organised crime remain among some EU leaders, and Croatia will not yet join the single currency or the free-movement Schengen zone, where most EU citizens are not subject to passport checks. But advocates of EU membership say despite this, their case remains a persuasive one. Two-thirds of Croatians voted in favour of accession last year. “It’s important for us primarily for the long term guarantees of political stability and then everything else – the single market too,” Croatia’s First Deputy Prime Minister, Vesna Pusic, told the BBC. The EU itself has given Croatia a clean bill of health – and praised reforms which improve the rule of law and tackle corruption. It hopes the other countries of the former Yugoslavia will be encouraged to join – and secure long-term peace for an historically turbulent region, reports the BBC’s regional correspondent Guy De Launey. 1991 – Croatia declares independence from socialist Yugoslavia but minority Serb rebels, backed by the Serb-dominated Yugoslav army, seize control of one third of the country and a four-year war ensues. 1995 – Croatian troops sweep through the rebel territory, putting to flight thousands of minority Serbs. A peace treaty is signed in November, ending the wars in Croatia and neighboring Bosnia. 2000 – A reformist coalition takes power in elections after the death of wartime leader Franjo Tudjman, the first president of independent Croatia. An EU-Balkan summit in Zagreb affirms that all Balkan nations have a future in the EU. 2001 – Zagreb and Brussels sign an associate membership accord, which calls for war crimes to be punished, refugees to return and for cooperation between the former foes of the ex-Yugoslavia. 2002 – Croatia refuses to hand over former army chief General Janko Bobetko to the United Nations war crimes tribunal for the former Yugoslavia in The Hague. 2003 – Britain and the Netherlands refuse to ratify the associate EU membership accord, citing insufficient cooperation with the tribunal. Croatia formally applies for EU membership. 2005 – The U.N. tribunal’s chief prosecutor tells the EU that Croatia is fully cooperating in the search for indicted former Croatian general Ante Gotovina, removing the last hurdle for the EU to open entry talks with Zagreb. Gotovina is arrested in Spain in December and handed to the tribunal. 2005-2008 – Talks progress slowly. By the end of 2008, Croatia had closed only seven of the 33 negotiating chapters of EU legislation, while EU neighbor Slovenia vetoes further progress because of an unresolved border issue. June 2011 – The European Commission says Croatia has met all criteria for the completion of EU entry talks, including the toughest chapters on judiciary and competition policy. January 22, 2012 – Sixty-six percent of Croatians vote “Yes” to joining the EU. November 2012 – The Hague tribunal acquits Gotovina and another Croatian general, Mladen Markac, in an appeal procedure after finding them not guilty of war crimes against Serbs. March 11, 2013 – Croatia signs an agreement to drop a legal case over a 20-year old bank dispute with Slovenia, which allows Slovenia’s parliament to ratify Croatia’s accession. 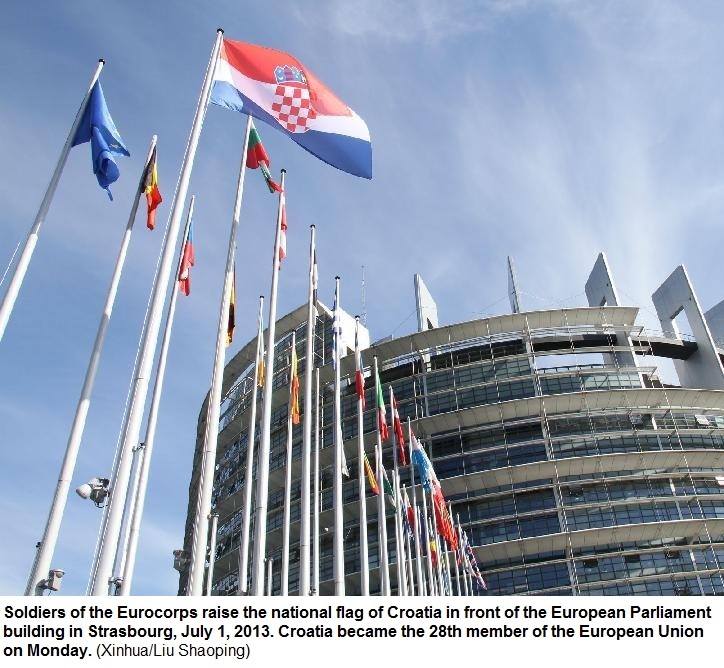 July 1, 2013 – Croatia due to join the EU.